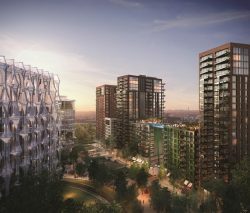 This regeneration area sits across the boroughs of Wandsworth and Lambeth. It includes Battersea Power Station to the west, Albert Embankment to the east and has 3km of river frontage. It is undergoing critical regeneration at significant scale and will deliver 20,000 new homes, 6.5m sq.ft. of commercial space and acres of revitalised and new public space. Its masterplan ensures multiple developers work together and its cultural strategy makes it accessible to all.